Gobbledygeek episode 269, “The Air Up There,” is available for listening or download right here and on iTunes here. When the apocalypse happens, wouldn’t you want to wake up in an underground bunker, shackled to a wall and pricked with a makeshift IV by none other than American screen luminary John Goodman? Well, cult icon-in-the-making Mary Elizabeth Winstead isn’t thrilled by her new circumstances, while the amiably bearded John Gallagher Jr. just wants everyone to get along. 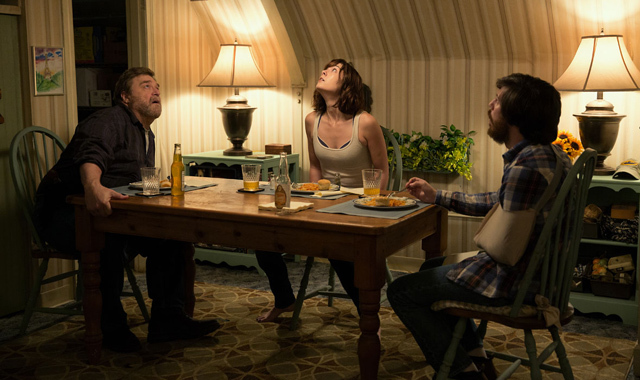 Paul and AJ, meanwhile, contemplate 10 Cloverfield Lane‘s connection to 2008’s found footage monster mash Cloverfield, debate its effectiveness as a psychological thriller, and stick up for child killers (wait, no, that’s just Paul). Plus, AJ’s dying. Again. 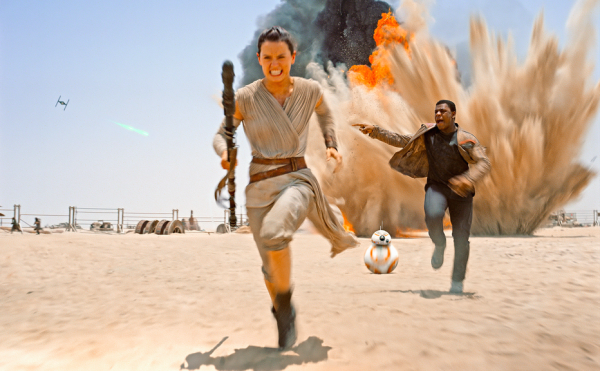 Gobbledygeek episode 261, “The Ford Awakens (feat. Eric Sipple, Kenn Edwards & Andrew Allen),” is available for listening or download right here and on iTunes here. For the season finale of Gobbledygeek, Paul and AJ turn to a little-seen, rarely discussed art film: Star Wars: Episode VII – The Force Awakens. Joining them are Kenn Edwards of So Let’s Get to the Point, Broken Magic author and The Deli Counter of Justice co-editor Eric Sipple, and Star Wars superfan Andrew Allen, scum and villains all. The Force Awakens is strong with nostalgia for the original films, a fact which sits better with some of our panel than others. The gang discusses why the movie leans heavily on the past, whether or not the series is capable of looking forward, the film’s place in the established Skywalker mythos, and how it has the exact opposite problem of George Lucas’ efforts. Next: we’re on winter break before returning in roughly three weeks’ time with a look at Quentin Tarantino’s The Hateful Eight; Eric Sipple and A/V writer-director Joseph Lewis bring us up to a Somewhat Disgruntled Four. In the meantime, thank you for a great 2015 and have yourself some happy holidays. Gobbledygeek episode 173, “S: Part 4 – What the Monkey Did (feat. Pam Smith, Greg Sahadachny & Kenn Edwards),” is available for listening or download right here, and on iTunes here. The long and winding road of the Gobbledy-Book Club has led us here, through factories and caves and cellars, to the final two chapters of J.J. Abrams and Doug Dorst’s S. Paul and AJ host an all-star jam band reunion of their co-readers: Paul’s better half Pam Smith, whom we have to thank for just about everything; The Debatable Podcast host and Ukrainian royal Greg Sahadachny; and Kenn Edwards of So Let’s Get to the Point and Project Batman, who might just be recording your entire existence as a podcast. Believe it or not, the show is (mostly) able to contain all five of them as they get to the important business of discussing the conclusions of both Ship of Theseus and the Jen/Eric marginalia, the importance of endings, and the open-ended nature of many of the tale’s mysteries (sound familiar, Lost fans?). Plus, the gang says goodbye to the late, great Harold Ramis. Next: the boys are on their own again to pay tribute to the work of Harold Ramis. They’ll be watching Meatballs, Stripes, Ghostbusters, and Groundhog Day. Gobbledygeek episode 171, “S: Part 2 – Sensible Vultures (feat. Gregory Sahadachny),” is available for listening or download right here, and on iTunes here. Shifting identities. Confessions of love. Chases in the dark. Names. Lots of names. These things and more can be found in chapters 4-6 of J.J. Abrams and Doug Dorst’s S., here discussed by your learned and astute co-readers. The Debatable Podcast‘s Greg Sahadachny joins Paul and AJ for the second week of the Gobbledy-Book Club, talking about the unique way he started reading the book, whether Eric and Jen’s marginalia or Ship of Theseus itself is more captivating, and what a “second” is. If the boys scratched the surface last week, this time they plunge headfirst into the dark, mysterious world of S. Come on in, the water’s fine. Next: discussion of S. continues as Kenn Edwards of So Let’s Get to the Point and Project Batman helps explore chapters 7 and 8. Gobbledygeek episode 170, “S: Part 1 – Writing in the Margins (feat. Pam Smith),” is available for listening or download right here, and on iTunes here. 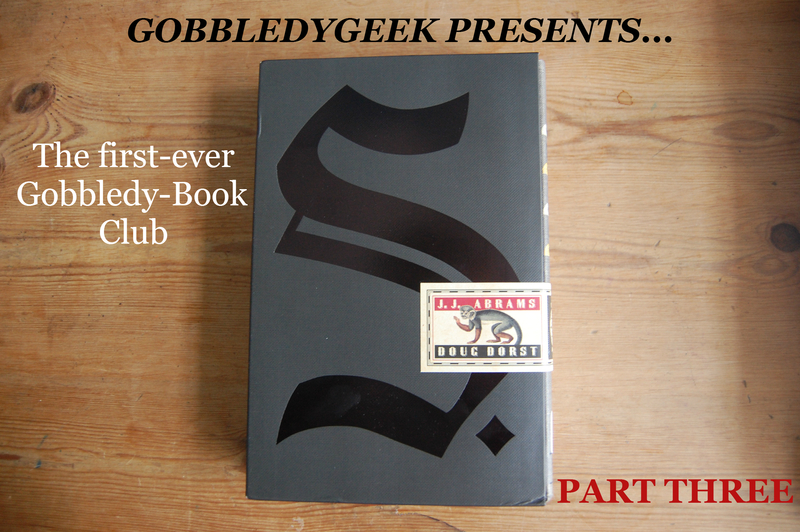 This week marks the beginning of our very first Gobbledy-Book Club, in which we’ll be discussing the J.J. Abrams/Doug Dorst novel S. every week of February. For our first discussion, Paul and AJ talk the book’s first three chapters with the lovely Pam Smith, who may or may not be married to one of your dashing hosts. The gang discusses the book’s seriously ingenious book-within-a-book structure, the pervasive concept of multiple identities, the numerous thematic/stylistic ties to Abrams’ Lost, all those cool little inserts, and how exactly you’re supposed to read the damn thing. Plus, we pay our respects to the late, great Philip Seymour Hoffman. 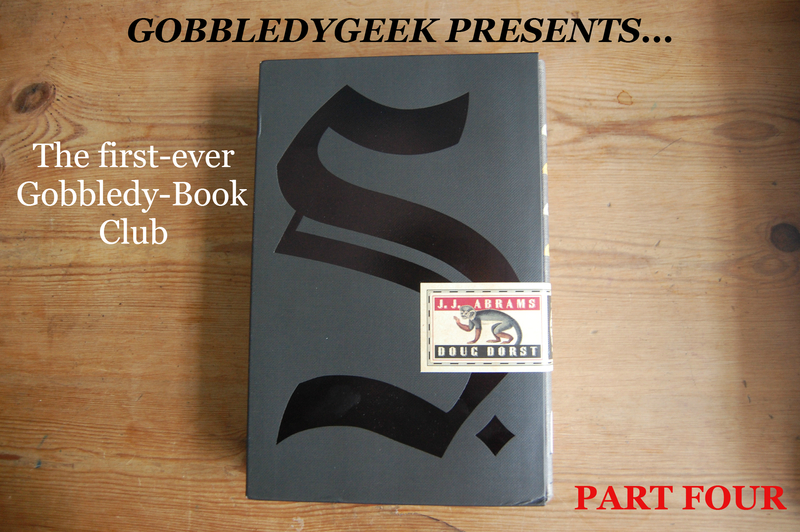 Next: the Gobbledy-Book Club continues with a discussion of chapters 4-6, pp. 111-259. Gobbledygeek episode 126, “Talking Turkey: Clodagh Power,” is available for listening or download right here, and on iTunes here. 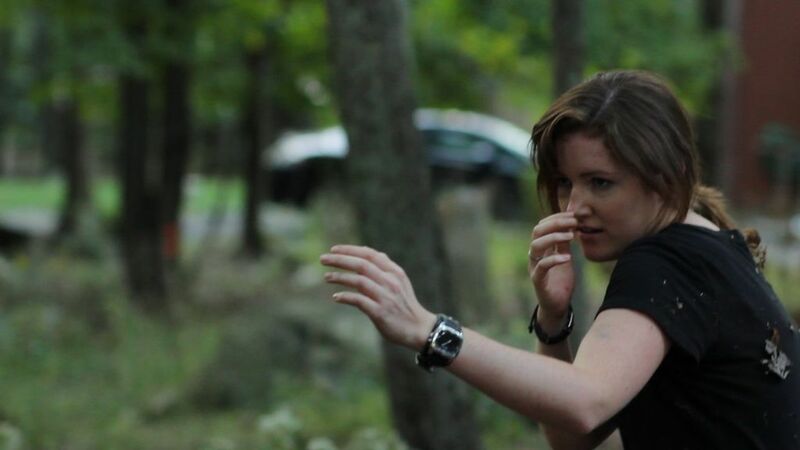 This week, Paul and AJ are joined by stuntwoman, martial artist, fight choreographer, and all-around badass Clodagh Power (those aren’t even all of her credentials!). They discuss her experience getting into stuntwork, the insanely violent art of Ninjitsu, filming the movie Evil Alive and the television pilot Hitting Home, and her deep love of Liam Neeson, among other subjects. Plus, the boys accept the fact that J.J. Abrams will be directing the new Star Wars and fawn over Silver Linings Playbook. Next: it’s the Spring Movie Preview!